The Division is an action-RPG developed by Ubisoft, and it goes deep into MMO territory. The beta for The Division has ended – and it was all sorts of awesome. But regardless if you got in or not, if you want to play The Division when it hits the streets, you need to know the following things. Unless, you know, you want all of your loot stolen and zero chances at getting out of a Dark Zone area alive. The Division will be released on March the 8th, 2016. The Division is available for PC, Xbox One and PlayStation 4. You can buy The Division from Amazon, Steam, GreenManGaming, Humble Bundle, Uplay and Ubisoft’s official website. The story in The Division is quite an interesting topic. Mainly because we don’t know that much. We only know that New York is in ruins after a disease that spread via banknotes during Black Friday. It takes inspiration from a real-life 2001 government-made simulation code named Dark Winter where an attack with small-pox from an unknown enemy targeted the U.S. The simulation ran for about 14 days, and it didn’t end well at all. Hospitals are overwhelmed, and the law enforcement collapses – staff doesn’t turn up to work due to people getting sick, or just abandoning the post; the streets are filled with people either dying because of the illness, or killing one another to steal supplies, and, hey, just because it’s mayhem, apparently. The Division bases its story on the Dark Winter simulation, but Ubisoft hasn’t said anything else besides that there are 3 branches of missions that the player needs to complete. At the end, players will get some sort of conclusion, but it’s crucial that before tackling the last piece of the puzzle, you complete all the missions in those 3 branches, as to have a better perspective. You are part of the Strategic Homeland Division, commonly called The Division. This group of volunteers wants to clear the streets of criminals and bad guys who see this apocalypse as a means to get ahead in life. You’ll mostly be fighting thugs and prisoners. Oh, and also post-apocalypse loonies called Cleaners, who want to cleanse the city by setting fire to whoever they think is riddled with the disease. They want to protect the survivors by killing the survivors – sound logic. As you kill people, do special quests and tasks, you gain experience points, which level up your character. The max level you can reach is 30, and Ubisoft has said that, most certainly, players will finish the story before hitting the cap. Finishing the story doesn’t mean game-over, as you have a Dark Zone to clear – more on that later; places to discover, items to craft, and loot to collect. Also, your base of operations is your second character. We only know that you can upgrade it as you wish. Kind of vague, but thank Ubisoft for that. Each mission is replayable in three difficulty modes – Normal, Hard, and Challenge. Each step further will reward the player with better loot. However, how many times can you replay a mission before you get sick and tired of the game? Ubisoft has said that this shouldn’t be the case as the company is planning to offer post-launch support by providing free-updates and pay-to-play DLCs. 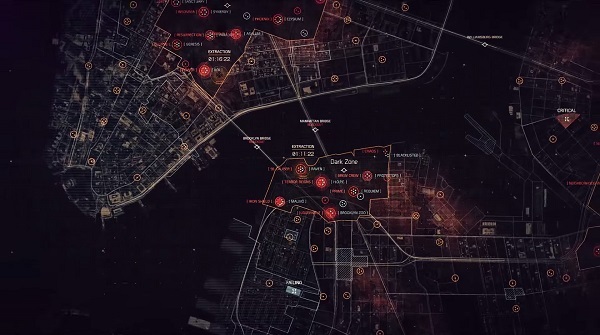 The Dark Zone is straight in the middle of the city, and it’s quite huge – it takes up about 30 percent of the world map. The Dark Zone is a mix of battlegrounds and instances – think of dungeons from World of Warcraft; where the player has multiple choices on how to go through it. In these areas you’ll be mostly fighting the A.I, but there will also be other players present. You can either shoot them, be super-neutral like Switzerland, or team up with strangers to clear the area. If you do attack other players, you’ll go rogue, meaning that you are an active threat to other agents. Basically, you have this giant mark on your head that tells everyone else not to trust you. It’s quite an unique experience as you never know who will back stab you in a Dark Zone, or who is to be trusted. Ultimately, it makes The Division the perfect game to be played with friends. There’s also a ranking system that’s similar to Call of Duty, but with a huge difference in how you progress. You see, you gain experience points by killing A.I enemies, performing certain tasks and hunting down rogue players – all within the Dark Zone. Yet, you will lose XP, subsequently lowering your ranking system, if you die in the Dark Zone. Furthermore, if you die as a rogue player the loss in XP is massive. In theory, it’s the perfect game mechanic to combat trolls and other players that don’t want to play nice. In my opinion, players will want to work with others so they can unlock chests in the Dark Zone, and reap better rewards by completing tough challenges together. Any loot that you gather in a Dark Zone, has to be extracted via a helicopter in order for you to use it. When you do so, other players will know, and for certain there will be several trying to take it. Don’t leave yourself unguarded just because you got to the extraction point!